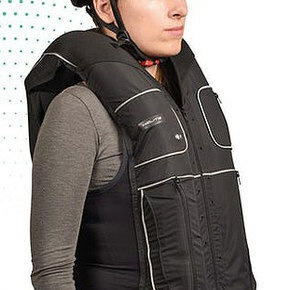 The Helite B’Safe cycling vest adds an extra layer of protection by automatically inflating when an imminent impact is detected. The vest system is made up of two parts—the reflective vest and a sensor located beneath the seat able to detect an impact to the bike. When an impact occurs, the seat-mounted sensor will trigger an alert to the motion sensor in the vest. If that sensor in turn detects the rider is falling off the bike, a CO2 cartridge in the vest will fire to fully inflate the vest, with the entire process taking only 80 milliseconds.